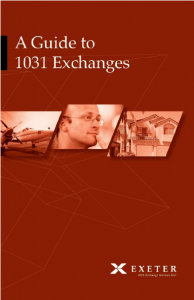 is designed to help you understand the many options available when considering 1031 exchange strategies for deferring taxes. After its first printing, we received such an overwhelmingly positive response from so many readers that we went to work to enhance this edition not only with more content, but with the most recent information available at press time. We highly recommend reviewing your investment strategies with your tax professional and financial adviser. 4) What a Qualifying Use Property really is about. Download this free eBook and we’ll automatically subscribe you to our Hassle-Free Cashflow newsletter. The newsletter is FREE, we never give out our list, and we promise not to spam you.